Hello and welcome to pie 99, The Hibernian Pie, on the home of all your Scottish football snack based needs Meat Filled Pastries. 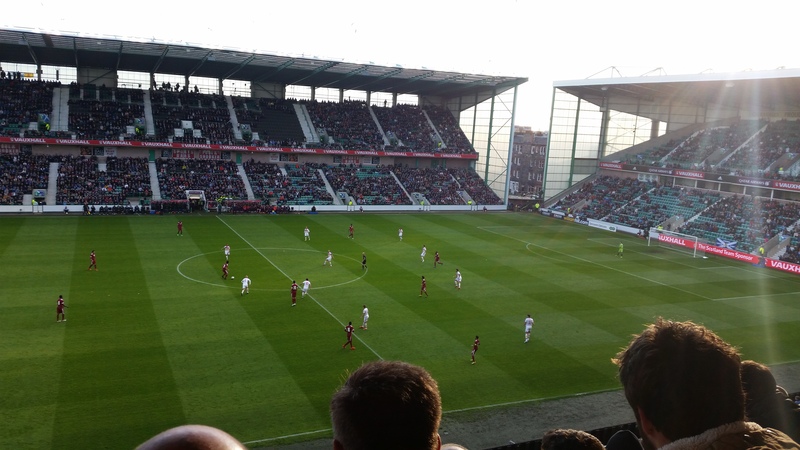 The 99th edition of this blog is brought to you by the Qatar Airways Cup as Scotland took part in one of the most insipid friendlies I’ve had the misfortune to attend. Not even the sight of a rotund individual channeling his inner Crazy in Love era Beyonce as he thrust his king prawn high (well not so high) into the Leith sky could stop this from feeling nothing more than a training exercise. International friendlies are such a strange commodity in modern football. If put into a coaching context they are vital in preparing for competitive fixtures, especially at the end of a season where many of your squad have gone a few weeks without a game. As a football association they provide a much-needed boost to the coffers to help finances tick over during the summer whilst also providing the opportunity to build a new working relationship with associations across the globe, although why Scotland chose Qatar to do with this, only Stewart Reagan and his human ivory caviar spoon will only know. For fans though it often feels like a fixture too far, not so much when Scotland travel away where a friendly become an end of season jolly, but when you’re at home, to Qatar or a team of a similar ilk. The atmosphere was one of the strangest I had ever experienced, with the stands sounding like a crèche buzzing as it was with thousands of children not really paying any attention. A few slightly more inebriated members of the Tartan Army tried to rouse a song or two only to be met with apathy. It’s in this respect that the UEFA Nations League could very well be an innovation that prevents this malaise and lead to the banishment of the phrase ‘meaningless friendly’. As it stood though any malaise I was experiencing was temporarily shaken off as I found a pie in my hand, so without much further ado let’s rate some pie! The Sunshine on Leith was shining straight into my eyes. Price: At £2.30 this is at the very top end of the Scottish Scotch Pie Price Scale or the ‘Triple S Double P’ as I have just dubbed it. 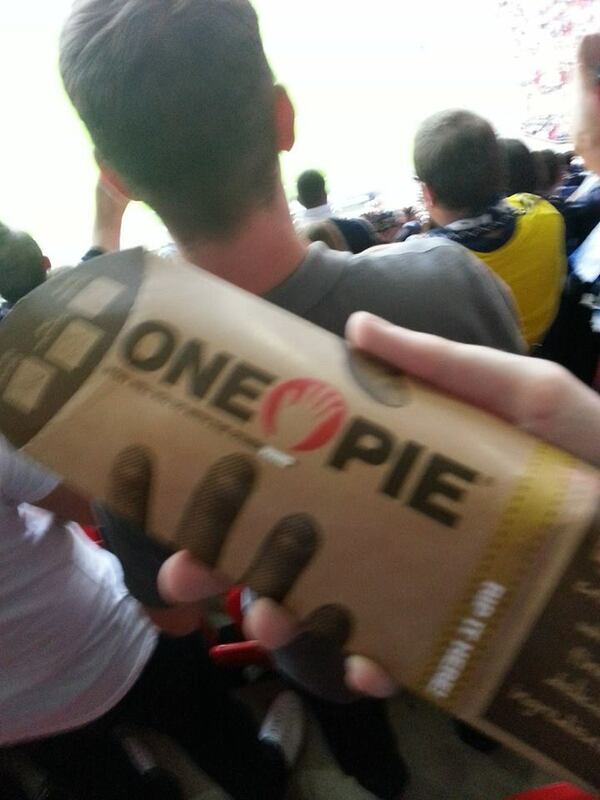 The equivalent of two junior scotch pies and of a similar price to those found at Hampden, Ibrox & Celtic Park. Pricey Pastry. Presentation: Pretty standard presentational style here coming as it did in an aluminium tin with a medium-sized white napkin to mop your mouth and shelter your palms from the incinerator like heat that it is greeted you when the pie is placed in your possession. Definitely feel liking my photography has got more imaginative as the 2014.15 season has come to an end. Meatiness: After successfully avoiding dropping my pie following a totally unnecessary pyro and smoke show prior to kick off I was left with a pastry that was just a bit dull. Yes it had a peppery linger that should be present in a good scotch pie but it had all the quintessential hallmarks of a mass-produced pie. It was a tad grey in colour and lived short in the memory. As I finished it I had flashbacks of my time at the World Scotch Pie Championships Judging Day where an average scotch pie became a bad scotch pie the deeper into the competition I got. Pastry: Safe. Golden. Perhaps a little soft and soggy bottomed due to the tin foil case it still held together just enough to make it a suitable bowl for the meat inside. Brown Sauce: Much like the rest of this ‘big league’ pie it was a soulless small brown sachet. Overall: It tasted like a pie, it had a peppery linger and it held together well but it left me cold come the end. Perhaps I’m being a little harsh but I have grown to view these mass-produced pies with a great degree of cynicism. When I eat these now I don’t feel the love of the butcher or baker, I taste the processing of the machines and the site of folk in white coats and hairnets are never far from my mind. I apologise to Hibernian for getting the brunt of this rant but it’s something that over this journey has niggled at me more and more. Gravy Factor: Bog Standard Bisto. “Cardiac Arrythmia is a risk”, I know! I could have done the whole song but I don’t think anybody would have wanted that, I’ve just tested it though and it actually fits pretty well so by all means have at it! Anyway pie 100 is in my sights today and at that point the celebrations really can get started. This entry was posted in Football Pies, Passport Pies, Professional Pies, Sporting Pies, The Life of Pie and tagged 99 problems, brown sauce, easter road, fitbaw, Football, friendly, Gravy, hibernian, jay z, Meat, meat filled pastries, mince, pastry, Pie, qatar, scotland, streaker, tartan army. It has taken nearly 16 hours of sleep and general slovenliness today but finally it is time to say welcome back to Meat Filled Pastries and Pie 66 on my quest to tell you about the best pies around. Today’s malaise has been brought as a result of a couple of days spent in London with the Tartan Army. This particular adventure took me to Craven Cottage a ground I have always wanted to visit for its refusal to turn itself into a cantilever carbon copy of so many grounds in the Premiership. The cottage in the corner with its 72-seat capacity, its sudden emergence from the heart of west London’s leafy suburbia and the river bubbling by at the side of the stand all designed to endear the ground to football traditionalists everywhere. At this stage I should probably confess this review may come across as a little fuzzy as a 7am flight from Glasgow meant that come kick off time at 8pm the same day I was rather well lubricated. 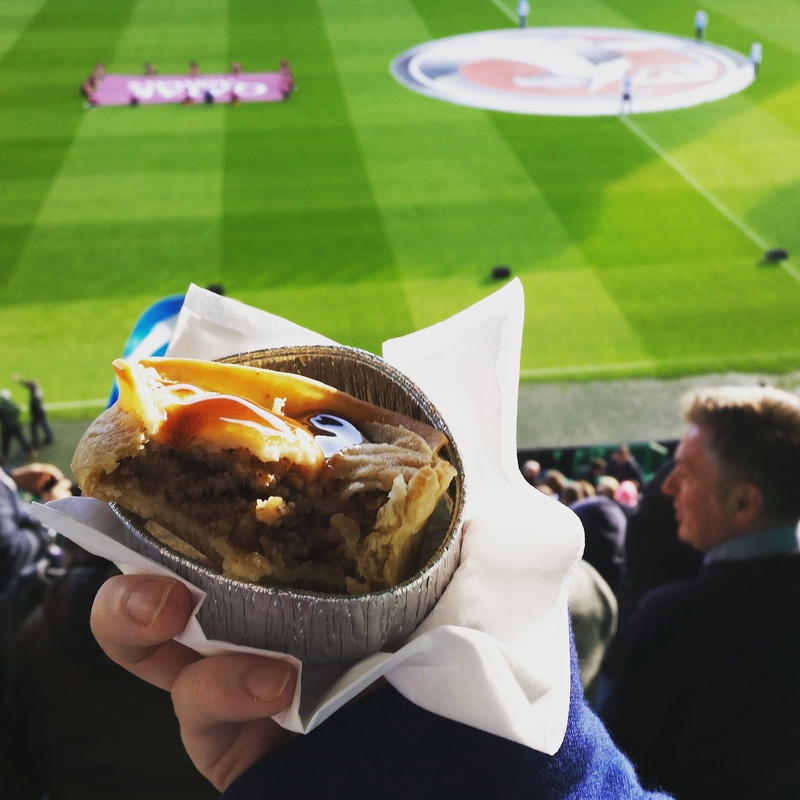 I’ve also made the assumption that this pie would be the same pie provided should I attend an actual Fulham game, as I’m not sure if there is a long history of meat filled pastries in Nigerian culture. Price: Considering Craven Cottage’s location in one of the more affluent areas of one of the most expensive cities in the world it should come as no surprise that this pie left a sizeable dent in your wallet. That dent was to the tune of £3.80, the equivalent of about 3 Scottish Junior Pies! Despite my suspicions being proven correct it still prompted an ‘Excuse Me! ?’ (the language may have been tidied up a bit here), as the young chap behind the counter opened the till. Presentation: I wonder if they would have knocked a pound of the price if I had just asked for a napkin?!? This pie was pimped. First at the base was a small cardboard holder producing additional shielding from the heat generated at the base of the pie transferring itself to the tinfoil case it was sitting within. Slotted between the cardboard holder and the tin foil case was a square of picnic-like greaseproof paper, totally superfluous to the consumption of the pie itself in that it did not help to hold the pie nor clean your face after its consumption, however, this was not the most ridiculous thing about it. Oh no, that was reserved for the plastic fork plonked, and I mean plonked, directly into the middle of the pie! A B#**@@”ING FORK! Do the delicate digits of the nearby Belgravians not appreciate getting down and dirty when it comes to eating a pie? Look girls, take off the silk gloves, tuck in your pearls, get your hands on this meaty marvel and get right set about it, if you get a bit of gravy on your chin then wipe it off with the napkin provided and then touch up your make up in the closest WC. DO NOT EAT A PIE AT THE FOOTBALL WITH A B#**@@”ING FORK. I challenge anyone to try to eat a pie with a plastic fork and see how long you last before your throwing it away in anger and getting elbow deep in your pastry. Meatiness: This is probably where this review is going to go downhill a bit as it is at this point that my review notes stop and my memory will have to come in to play, so I apologise for what may be about to follow. Reviewing my notes I am able to tell you that the meat inside was formed by large chunks of steak, my preference when eating a luxury steak pie, but from here though it’s a struggle. I’m assuming there was an abundance of gravy as when I woke up in the morning a gravy smattered napkin was in my jumper pocket and I do remember thinking that the pie was well seasoned within. Whether or not it was £3.80 worth of well seasoned? Well, a second trip may be required. Pastry: Now for some reason I have a pretty good memory of the pastry. The top of the pie was a thick-ish layer of puff pastry, the kind of puff where you can noticeably see the layers and it flaked nicely as I bit down. The top of the filling and the bottom of the top crust mixed well and although there were a couple of spillages more than likely down to my compromised dexterity the pie held together well throughout. The edge of the crust where the walls and top met were a little thick for my liking, a minor grumble but that thick edging would have no doubt broken any plastic fork that attempted to break it down. Overall: A good but pricey steak pie that kept this drunk man’s hunger at bay. 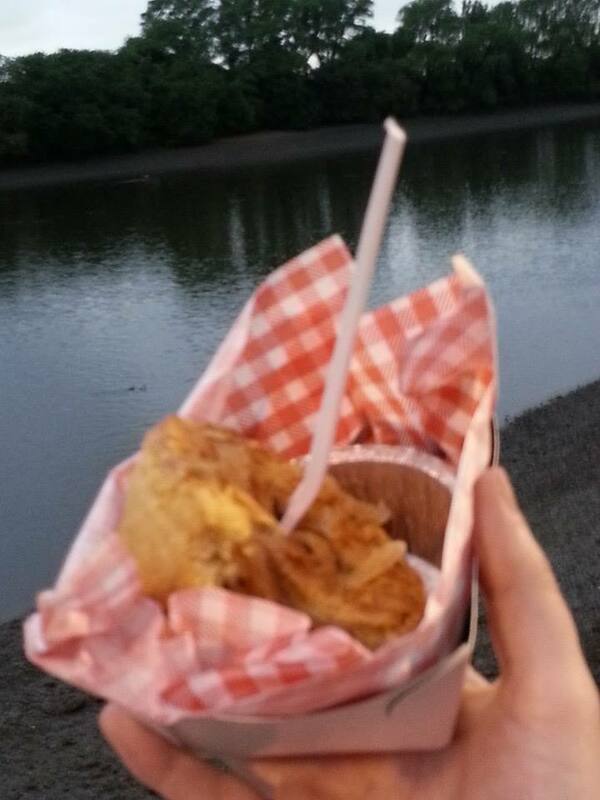 It was presented like a box of chocolates and it would be remiss of me not to say that eating a pie by the riverside was how I’d like all my pie tastings to be. There was no scotch offering but that was to be expected. Gravy Factor: Look, you just don’t eat gravy with a fork no matter how luxuriously it’s priced! Another pie done, I’m almost tempted to call this a bonus pie, purely on the basis that I wasn’t expecting to remember it sufficiently for a coherent review but I think I’ve done a pretty good job considering. There’s still a few more pie reviews to come before things kick off in Rio at which point I’ll be taking a break from the pie chat for a few weeks. However until, next time go forth an eat pie! This entry was posted in Football Pies, Passport Pies, Sporting Pies, The Life of Pie and tagged al fayed, belgravia, craven cottage, fitbaw, Football, fork, fulham, Gravy, Meat, nigeria, pastry, Pie, pies, puff, riverside, scotland, steak, tartan army.